Featuring Quavo, PARTYNEXTDOOR, Swae Lee, 2 Chainz, and more. Those listening to Episode 35 of OVO Sound Radio were treated to a surprise drop from none other than up-and-coming producer Murda Beatz, who dropped his new 13-track mixtape, Keep God First, during his set. 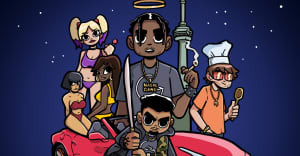 The 22-year-old Ontario native recruited a real who's who of right-now rappers to spit over his beats, including Migos members Quavo and Offset, Swae Lee of Rae Sremmurd, 2 Chainz, Jeremih, Ty Dolla $ign, 24hrs, and Playboi Carti as well as Toronto rappers Pressa, Jay Whiss, and Smoke Dawg. Check out the whole tracklist and stream the mixtape via Soundcloud below.